Chris Pratt and Jennifer Lawrence fall in love in space aboard a maybe-doomed spacecraft in Passengers, written by Jon Spaihts (Prometheus, Doctor Strange) and directed by Morten Tyldum (The Imitation Game). Look, you had us at Chris Pratt. All that other stuff is just gravy. Advance word on the film is fantastic—and the first images are here to get us even more excited. It’s one of those stories that really grabs you and you fall in love with it. It’s very smart and funny and clever and such a page turner I couldn’t put it down. Every 10 pages, something new happens! At the same time it’s a very intimate movie while taking place on this epic scale. For me, it’s a story about what’s important to live a full life. What are the things we need as humans? It’s not afraid to entertain but at the same time it asks big questions about what does it mean to really feel happy. Every generation has its love story. I feel like this is it. I had to do it. 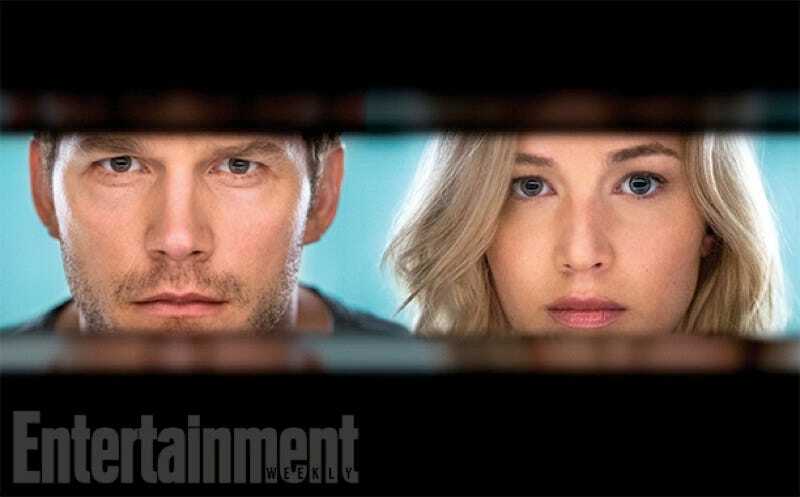 Passengers is out December 21, making it our second-most-anticipated film set in space that’s out that month.